The Canon Henry Cup has a habit of setting the scene for dramatic games and last night was no different. Competition rules state that only 5 players that played championship last year can be on the field at one time, this means there is fair mix of junior and senior players on both sides. 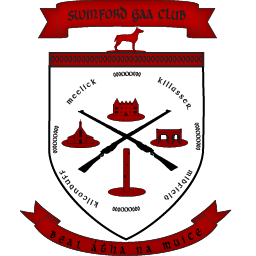 In the same tie last year, Swinford won by a couple of points so another close game was to be expected to played out in Gilmartin Park, Kiltimagh. Swinford started the stronger getting the first goal of the game via Darren Campbell and taking the score 1-02 to 0-02. However, Ballaghaderreen seemed to come to life thereafter and by half time the score was level. In the second half, both sides traded scores and with around 10 minutes left to play, Swinford led by a point 1-05 to 0-7. However, Swinford lost the ball 5 yards from their own goal and Ballaghaderreen didn’t ask twice to score the pivotal goal of the game. The game swung to Ballaghaderreen’s advantage and with the next play they went on to score a superbly well-worked goal, passing around the Swinford defense patiently, waiting for an opportunity and then striking with lethal precision to put the game to bed. Typical of a Canon Henry game however, Swinford had 2 really good goals chances to retain the lead but lacked Ballaghaderreen’s clinical finish and lost out to Ballaghaderreen on the night. Swinford will be disappointed to lose as they had plenty of chances to win the game, however they cannot have too many complaints as the more clinical team won on the night and congratulations to Ballaghaderreen on winning the Canon Cup. Positives from the game were the fine performances from Conor Horan and Darren Campbell, they look to be finding some good form at an important time in the season. Swinford have a Michael Walsh game against Bonniconlon on Saturday 14th, at 7pm. They will look for a winning performance as the crucial championship game against Parke is only the following week. Thanks to Kevin Quinn for sending on the pictures.